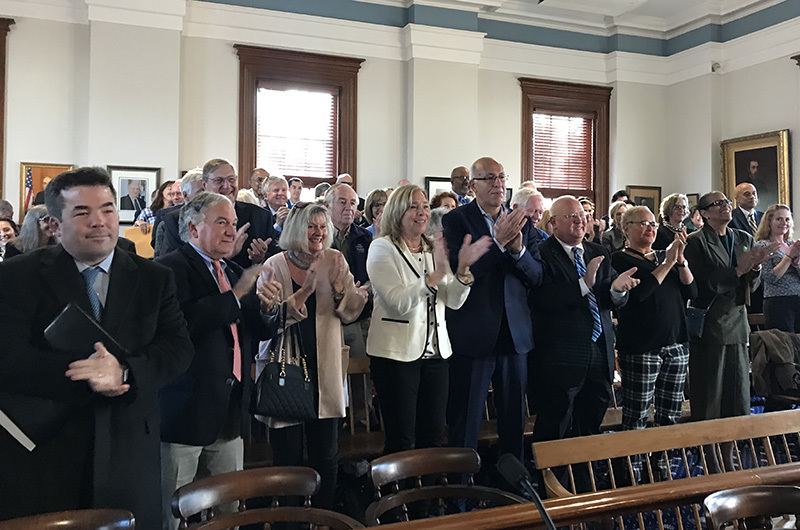 A standing room-only crowd packed the main courtroom in the Edgartown courthouse Thursday afternoon to honor superior court clerk Joseph E. Sollitto Jr. for his 42 continuous years of service. On hand to pay homage to the respected clerk were retired judges, retired clerks, Island lawyers, nearly the entire courthouse staff, and many friends and family members. Proclamations were sent by the Massachusetts House of Representatives and Gov. Charlie Baker. Letters were read from the chief justice of the Supreme Judicial Court and the chief justice of the superior court. The afternoon ceremony featured many of Mr. Sollitto’s colleagues telling hilarious stories, sometimes at the good-natured expense of the guest of honor. There was a story about the time as a young Oak Bluffs police officer, he locked himself in the back of a cruiser. There was a story about the time he ordered a court officer to go outside and commandeer a small flag that had seen better days, wipe the dirt off where it had been stuck in the ground, and hand it to a high-powered lawyer to use as a pointer. 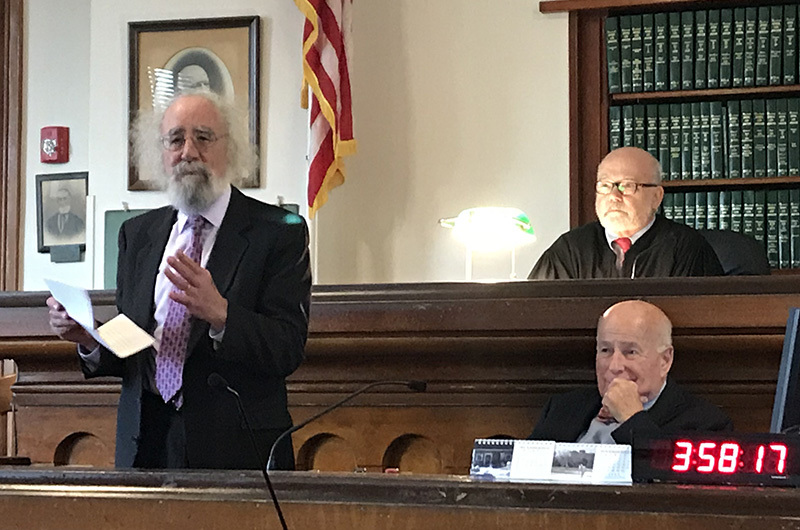 There was a story about how as a young lawyer, he used to revel in listening to older folks in the courthouse and soaking up their history lessons. “He was old before his time,” said longtime attorney Jeff Norton with a laugh. Mr. Norton gave Mr. Sollitto his first job in the legal profession. 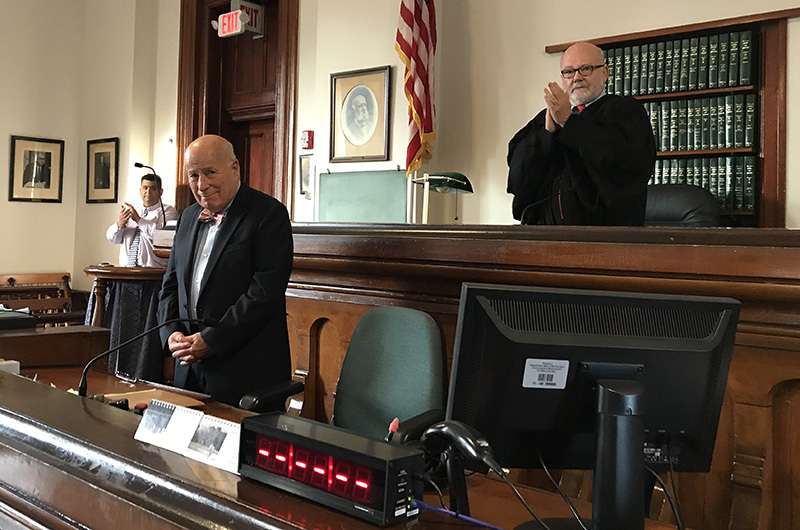 Attorney Ron Rappaport wished Mr. Sollitto a long and rich retirement, after running the court for so long with dignity and respect. On the last day and the last hour of Mr. Sollito’s last superior court session, the Hon. Cornelius J. Moriarty 2nd called him a dear friend and the finest clerk he had ever known. 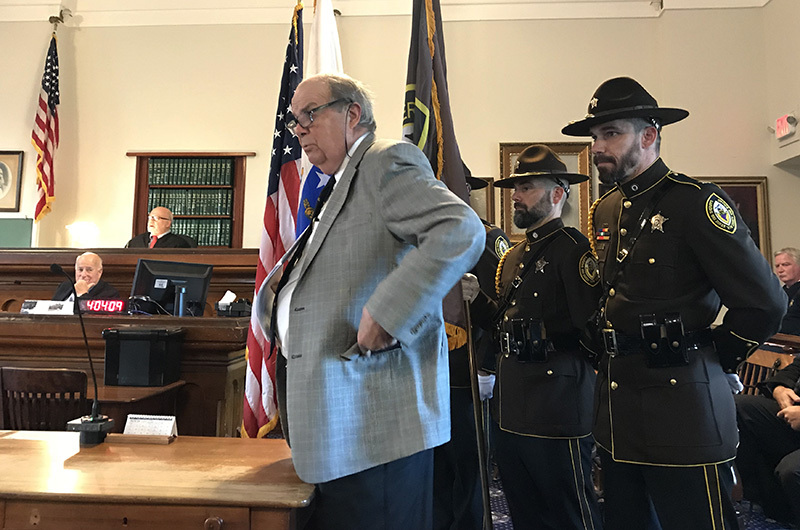 When it came time for Mr. Sollitto to speak, he thanked a long line of courthouse staffers, former clerks and judges who he said helped him along the way. He thanked the people of Dukes County for their support in voting him to seven terms as clerk. He even thanked his cats and his dog. Finally, with emotion brimming over, he thanked his family. Even he had a funny story, about the time when he was summoned to sit on a jury. Up to that point, he had managed every jury that came to sit. Finally, he summed up his philosophy as a clerk, to treat everyone with equal respect. “It’s our responsibility, the people working in the court, to make them feel comfortable, and show them that justice does work,” he said. Thank you, Joe. You have set the bar very high for those who will follow you. Now, go out and have a ball! He would of made a good Judge as well. This island has been so fortunate to have you in this incredibly important position for these many good years.They were good because of your integrity, compassion and fair judgement.They were good because you represented the highest principles of the justice system.Your impeccable reputation is evidence of how this community regards you.There is much appreciation here. ALL THE BEST! Irreplaceable, one in a million. Thank you for your service. Jury duty won’t be the same. So long Joe great job. Congratulations Mr. Sollitto! Well deserved rest, and thank you for your service. Joe is a very good man. I met him in 1969, his first year as an OBPD officer and i was in my second year. He was the kind of partner who always had your back. Whenever we were called to break up fights in one of the bars, you knew he had your back. Joe is small in stature but local tough guys soon learned that this guy was a USMC Fighter. He could break up most fights with just his sense of humor. If you were his friend, you were a friend for life. A Very Good Man leaving a job well done. Congratulations Joe, may you have a long and pleasant retirement! Best wishes Joe to you and your family as you retire. Thank you for your service and the "Z" from many years ago.